The Isle of Portland juts out like a bird's beak from the mainland in Dorset into the English Channel. The sea around the coast is hazardous and vessels are prone to shipwreck. 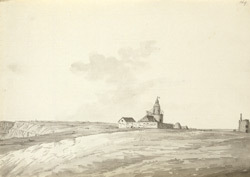 In Grimm's time there were two lighthouses on the island - one built in 1716 and the other in 1789, one year before he sketched this view.